This board interfaces four AcroPack mezzanine modules to a PCI Express bus on a PC-based computer system. It is designed to provide isolation between the AcroPack field I/O signals and the host when used with an isolated AcroPack module. Four AcroPack module slots give you the freedom to mix a variety of I/O functions (A/D, D/A, digital in, digital out, serial I/O, FPGA, etc.) on a single board. Or, combine modules of the same type for almost two hundred channels on a single card. Either way, the APCe7040 saves your precious card slots and reduces your costs. Select I/O modules from Acromag’s offering or use most third-party mPCIe compliant modules. 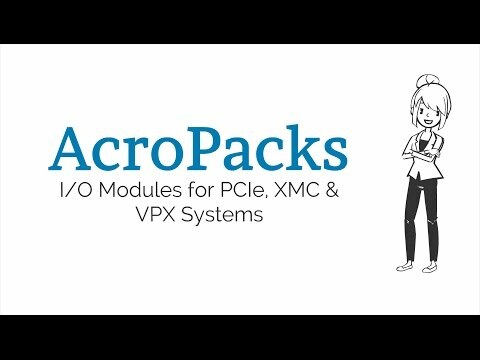 The AcroPack® product line updates our popular Industry Pack I/O modules with a PCIe interface format. This tech-refresh design offers a compact size, low-cost I/O, the same functionality and memory map of the existing Industry Pack modules. This device meets or exceeds all written PCI Express specifications per revision 2.1. Includes a PCIe Gen 2 switch to expand the single host PCIe port to four ports, one to each device (AcroPack or mini-PCIe). The host port consists of four PCIe lanes, each of the mini-PCIe sites have one lane each. Connector: Four 68-pin CHAMP cable connections. Pin assignments are defined by the installed AcroPack module. The field side connector of the AcroPack I/O module mates to a Samtec SS5-50-3.00-L-D-K-TR socket connector P2 on the carrier board. Gold plating in the connection area, M2.5 screws and spacers provide excellent connection integrity and stability for harsh environments. A unique carrier and site number can be set for each AcroPack site by a DIP switch. This provides the capability to distinguish a particular AcroPack module from others when multiple instances of the same module are used in a system. A standard 14-pin Xilinx JTAG programming header is provided for programming and debugging the FPGA on some AcroPack modules. The JTAG ports of the four AcroPack modules are daisy-chained. Length: 12.283 inches (312.0 mm). Height: 4.375 inches (111.12 mm). Storage temperature: -55 to +125°C. +3.3 Volts (±10%): 0.383mA typical. +12 Volts (±5%): 0.175mA Typical. The APCe7040E-LF has four DC/DC converters to provide the power supply voltages to the AcroPack modules that are not present at the host interface. The +1.5 Volt supply is sourced from the +3.3 Volt host power. The +5 Volt, +3.3 Volt and -12 Volt supply is sourced from +12 Volt host power. • Fused +1.5V, +3.3V, +5V, +12V, and -12V DC power is provided. A fuse is present on each supply line serving each AcroPack module. PCIe AcroPack carrier, holds 4 AcroPack boards.